The fifth warship so-named, HMS Illustrious has been serving the Royal Navy since 1982. Although smaller than the typical aircraft carrier, Illustrious and her sisters have proven invaluable to the Royal Navy. 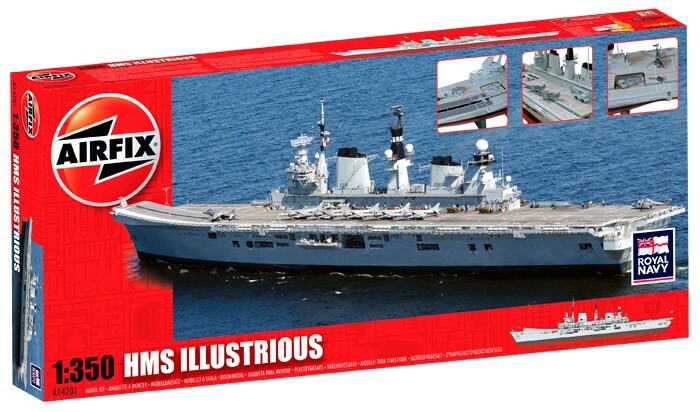 The new Airfix kit represents the Illustrious after her 2002 refit. The kit contains 276 light gray parts with better-than-average detail. You can build a full-hull or waterline model; if you choose the latter, you will have to make your own base plate. You can also pose the elevators at different heights. The instructions, which were confusing, come in a 28-page booklet with 113 steps. You also get a really nice little book about the history of the ship, and the box art has two large photos of the carrier. Construction starts with the hangar; then the hull sides go on. From there, the instructions jump to the island (steps 16-40). Then you go back to the hull. Due to the poor fit of the stern section (Part 14A), I suggest concentrating on getting the basic hull and flight deck done first. Pay special attention to 14A and how it fits to the rest of the hull parts. I was very careful with this, but I still needed a good amount of putty and sanding to get a nice finish. Take your time with it. The hull halves of my review kit were warped, which made things a little more difficult. The superstructure went together well but also required a lot of putty. The main parts, 48C and 47C, have a seam that runs the length of the island. Other seams on the bridge and funnels need to be sanded and puttied also. None of this construction is difficult, it is just annoying that there are so many seams needing so much work. The small parts on the kit are very good. Radars, guns, boats, and aircraft are above-average moldings. The Goalkeeper close-in weapons-system units are very sharply molded, too. A full complement of aircraft includes two each of two different Harriers as well as two Sea King and two Merlin helicopters. All of the aircraft are crisply molded and well detailed. The decals are well done, too: Their registration is excellent and the colors are accurate. Airfix gives you extra strips in case you mess up a nice touch. The decals went on well and settled onto the surface with little trouble. The painting guide was helpful, but I would have liked to have had other paint colors besides Humbrol's. I didn't use the paints supplied in the kit. That left me searching for appropriate colors; I settled on Testors Model Master dark and light ghost, plus Floquil engine black and hull red. For the aircraft, I grabbed what looked close; Airfix calls out Humbrol paint numbers but does not tell you what those colors are. I spent 32 hours on the build, most of it fitting, filling, and sanding. The end result is a nice model, and it's good to see a modern British ship in 1/350 scale. The kit's details are fine, but its fit and engineering are poor. Still, I can recommend it to experienced builders. I wish I could have spent more time on it, because it could be a real show-stopper.